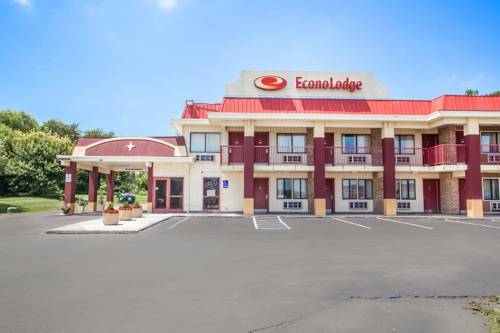 Travel simply and enjoy an easy stop on the road at the pet-friendly Econo Lodge Kearney - Liberty hotel in Kearney, MO. We are near Jesse James Festival, James Farm, Smithville Lake and Worlds of Fun. Amenities include free WiFi, free ample parking, free Easy Starts continental breakfast, free coffee, copy and fax services, guest laundry facilities and a seasonal outdoor pool. Guest rooms feature a coffee maker and HDTV. Also, earn rewards including free nights and gift cards with our Choice Privileges Rewards program. Limit of 2 35-lb. pets/room, USD15/pet/night. - Kansas City Int'l. Arpt. - Bartle Hall Convention Ctr.